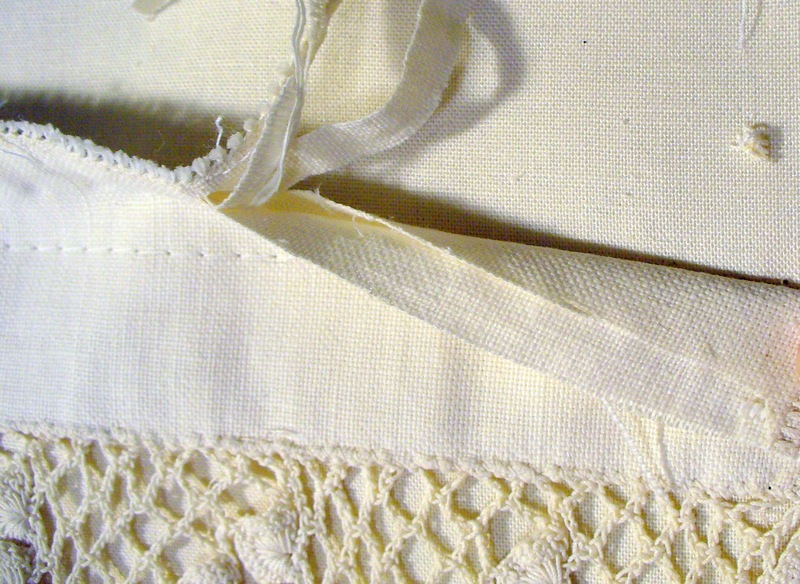 My friend, Karen, is also a Linen Lady and she recently asked me how I create my beautiful hanging sleeves with the lace. I've never really thought anyone would be interested in that but since she asked I thought there may be more of you who may want to know. Once my quilt is blocked and the binding is machine sewn on, it's time to think of the sleeve. 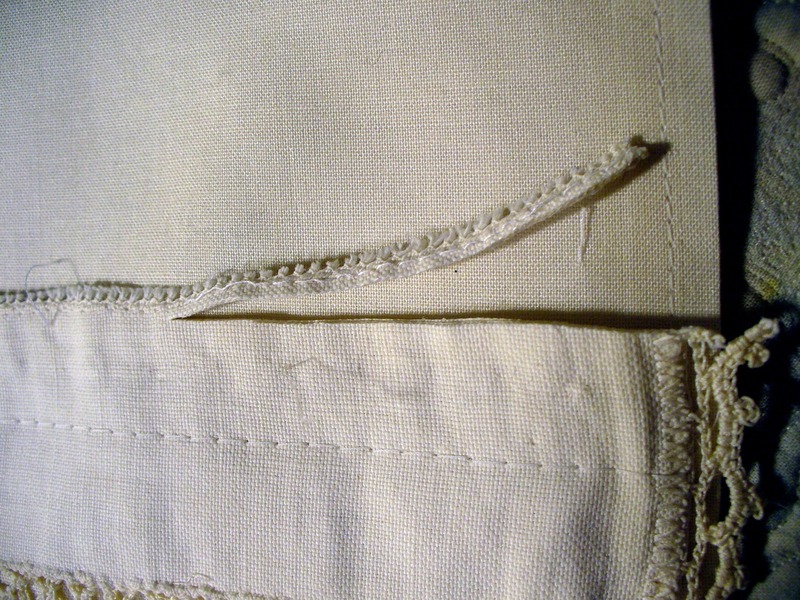 I always love to fuss up the backs of my quilts with beautiful sleeves and signature linens. 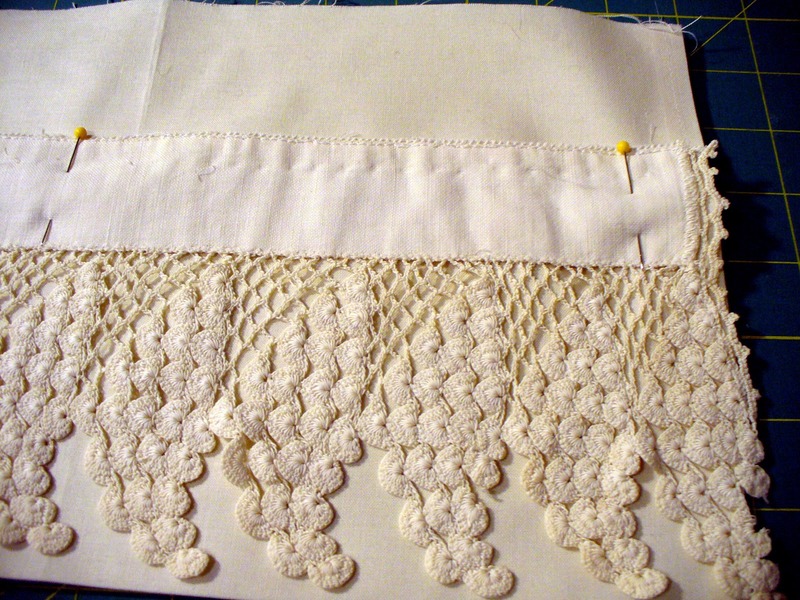 This is a great way to use up bits and parts of lace, pillowcase ends, coasters, etc. I will only be showing how I've created the hanging sleeve for this particular quilt. I decided upon a beautiful piece of tattered lace that was attached to four layers of fabric. It was the perfect size for the yellow quilt with no cutting involved. 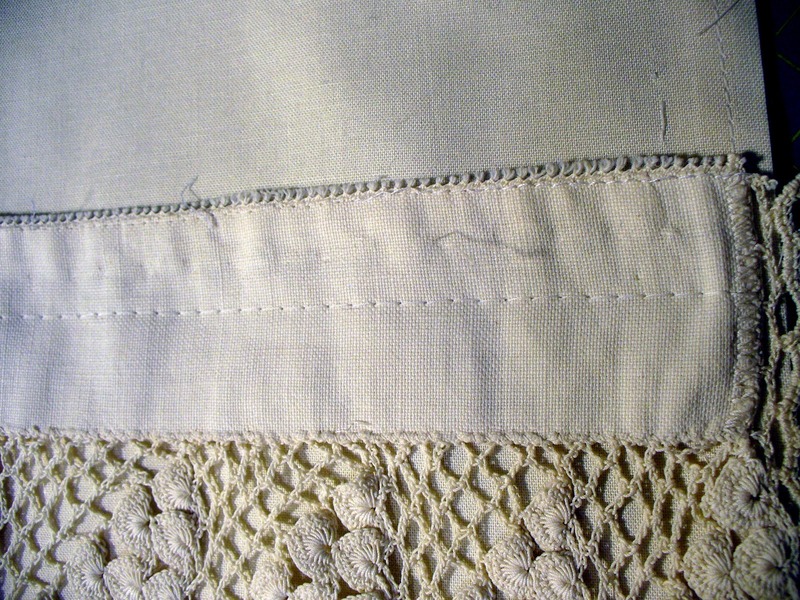 Because the lace is very delicate and a bit tattered already it was going to require a little support to keep it from ripping. 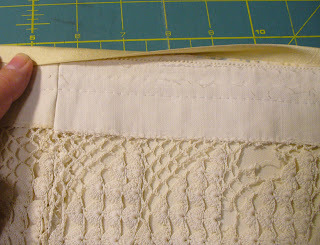 I placed my lace on top of the Kona cotton and basted in place and trimmed to size. Because my binding will be going over the top of this to finish it off, I needed to "debulk" this. I will never be able to get a needle thru all of these layers. I carefully trimmed three of the four layers out of this piece which helped tremendously. 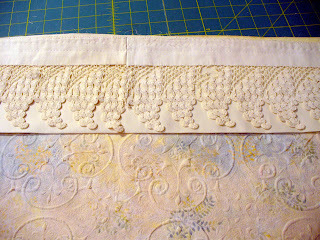 I pinned my pretty hanging sleeve to the yellow quilt and will carefully fold the binding over this top raw edge which gives me a finished edge. 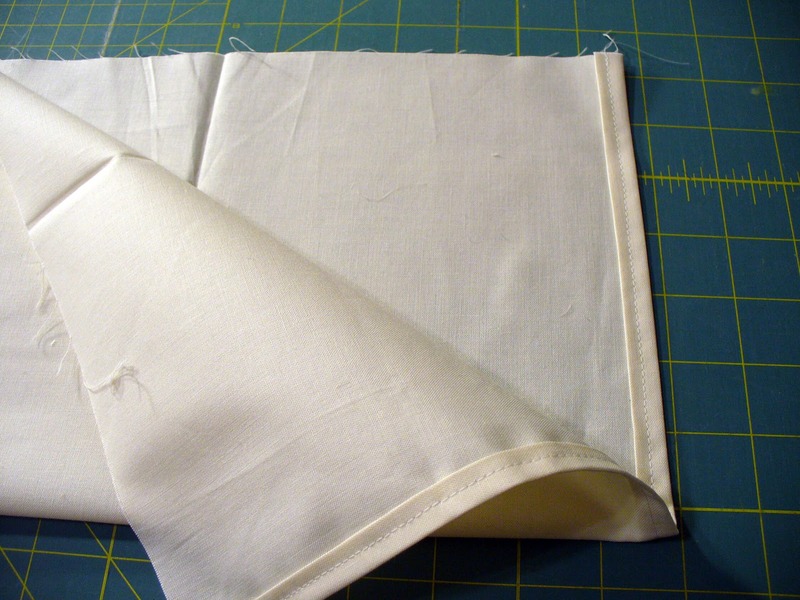 I will eventually hand sew the folded edge of the Kona cotton sleeve down to the quilt. 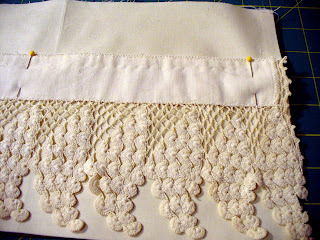 In reality, since this is such a fancy piece and has long, loose lace, I am going to hand tack this lace to the hanging sleeve BEFORE attaching this to the quilt. I don't want the lace to be loose and catch and rip on something. 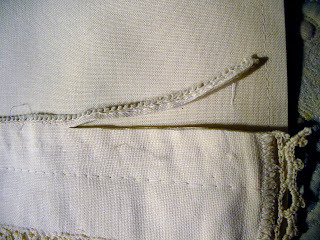 In the instance of this particular quilt, I am going to sign it on the linen part of the hanging sleeve. I am adding quite a bit of beadwork to the back of the quilt to hide my French knot boogies and don't want to cover up all my hard work. 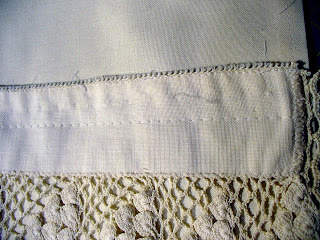 What a gorgeous piece of lace.....I'd want to use on something spectacular, too! What an extra treat to see when looking at the back! Wonderful!